When it comes to huge photographs, nobody does it better than Jeffrey Martin. He’s probably the most notable panorama photographer in the world, having already captured the London skyline and a Czech library. Now, he’s taken his talents to Wembley Stadium and captured the world’s largest panorama photograph of a sports stadium with a 360-degree, 10 gigapixel panorama photo of Wembley Stadium taken during the FA Cup Final. Granted, it’s not quite as big as the picture of space NASA captured, but this is pretty huge nonetheless. In order to capture the detailed images, Martin combined a DSLR camera on a special robot rig with an oversized Fujitsu computer with 192 GB of RAM and 24 processing cores to combine more than 1000 high-res photographs taken of the inside of the stadium. Talk about your staggering photographs. 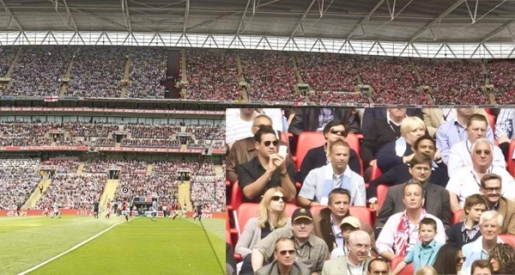 If you were at the FA Cup, or know someone who was, feel free to help tag the photo at Wembley Stadium’s website.